The theme of this year’s Late Late Toy Show is The Greatest Showman. THE FESTIVE SEASON will officially kick off for the kids, big and small, who will tune into the Late Late Toy Show tonight. An average of 1.3 million people tuned into the show last year, making it the most watched Irish programme of 2017. 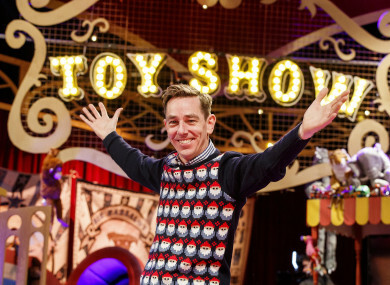 During a briefing with members of the media, host Ryan Tubridy revealed that the theme of this year’s Toy Show will take inspiration from the film The Greatest Showman, which will see a circus-inspired set. “Having The Greatest Showman as our theme this year is helping to emphasise the essence of what I believe the Toy Show should be – inclusive. “This year we are celebrating the kid who doesn’t get Snapchatted, or who don’t always have someone to sit beside on the bus. These kids aren’t lonely or unhappy, they just find joy in their own way,” Tubridy said. He is set to fill the top hat of the musical’s lead character, PT Barnum, who is played by Hugh Jackman in the film. The opening number of tonight’s show will see Tubridy singing for the first time, something he says he’s going to “give a lot of welly”. “I’ve never sung, I’ve only just acted the maggot, but they’ve asked me to sing. Just when you thought you had no comfort zone to step out of I’ve found it. It’s one thing to sing in a karaoke booth after three drinks, it’s quite another thing in front of over a million people. Tubridy added that he thinks the children watching will be delighted with his vocal ability but knows the adults will say he “hasn’t a note in his head”. During the opening musical number, Tubridy’s costume will be modelled off Hugh Jackman’s in the film. “The costume for the opening number is pretty intense, it’s the ringmaster, so it’s a full-on top hat, coat, the whole lot,” Tubridy said, but assured that a Christmas jumper will emerge at some point. This year’s Toy Show cast will include more than 200 young performers and over 30 toy testers. Tubridy told reporters that he believes the show has evolved from focusing solely on the toys to now being all about the kids and their stories. “When the soldier dad emerged from the big box last Christmas, that was a game changer for me because I realised it’s not about the silly stuff. I don’t know how I’m going to keep it together. I seem to be quite emotional about this year, don’t know what it is, but it’s got right under my skin. The Late Late Toy Show airs tonight at 9.35pm on RTÉ One, and will be available to watch worldwide for free on RTÉ Player. Email “'It’s got right under my skin': Tubridy emotional ahead of tonight's Toy Show ”. Feedback on “'It’s got right under my skin': Tubridy emotional ahead of tonight's Toy Show ”.